Psychic powers would be a great thing to have. Who wouldn’t want to be able to do things with the power of their mind? The thrill of that kind of power lies at the center of Double Fine’s Psychonauts, a classic PS2-era adventure (and also the company’s debut title). That work utterly charmed with its wacky characters and offbeat sense of humor, only to end on a cliffhanger. This brought much wailing and gnashing of teeth from fans, and more than a decade would pass without any clear prospects for a continuation. 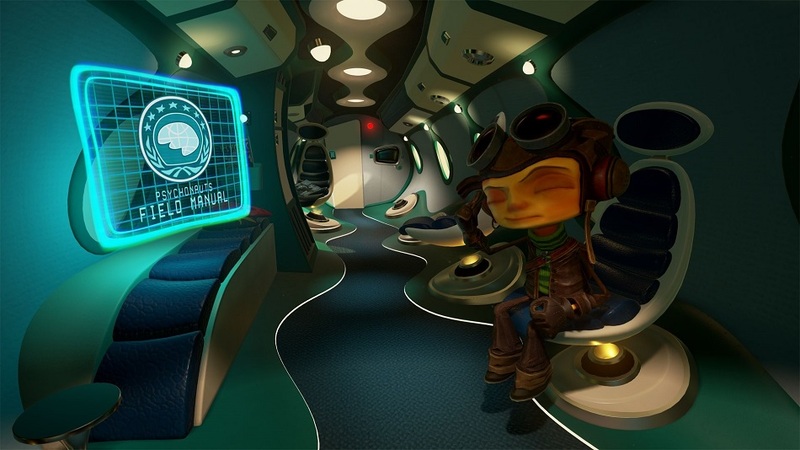 Psychonauts in the Rhombus of Ruin aims to be a balm to soothe that ache, while also being the studio’s first leap into the VR pond. The end result turns out about as well as could be expected of a Virtual Reality debut title. Psychonauts in the Rhombus of Ruin is at its best when viewed as something approximating a playable teaser for the still-in-development Psychonauts 2. Narratively, the game serves as a bridge of sorts, beginning minutes after the cliffhanger ending of Psychonauts. Protagonist Razputin “Raz” Aquato has just been commissioned as a Psychonaut (a psychic secret agent) and has gone jetting off on his first mission to rescue the father of his squadmate, Lili Zanotto. Alongside him and Lili are fellow squaddies (and Psychonauts alumni) Sasha Nein, Millia Vodello, and Coach Oleander. Their destination? The Rhombus of Ruin, a region of mystery not unlike the Bermuda Triangle. Along the way, Raz will find puzzles to solve, tasks to perform, and perils to avoid using a wide array of psychic powers, including telekinesis, pyrokinesis, clairvoyance, and “brain poking”. All of the above is done using the PlayStation VR headset and standard controller. The PS Move motion controllers are not supported. The game goes out of its way to emphasize that Rhombus of Ruin is played from a seated position, and arranges things so that Raz needn’t get up from his chair to get the job done. This works well as a design conceit, as the seated calibration is less prone to sickening players, and also fits in with the psychic-powered motif. After all, moving things with one’s own mind would result in one never needing to get up. Players who know these characters and have at least some familiarity with Psychonauts will get the most out of taking the plunge with Rhombus of Ruin, but the game does do a credible job of standing alone, or at least as being sort of a hype piece for the “real” Psychonauts sequel. 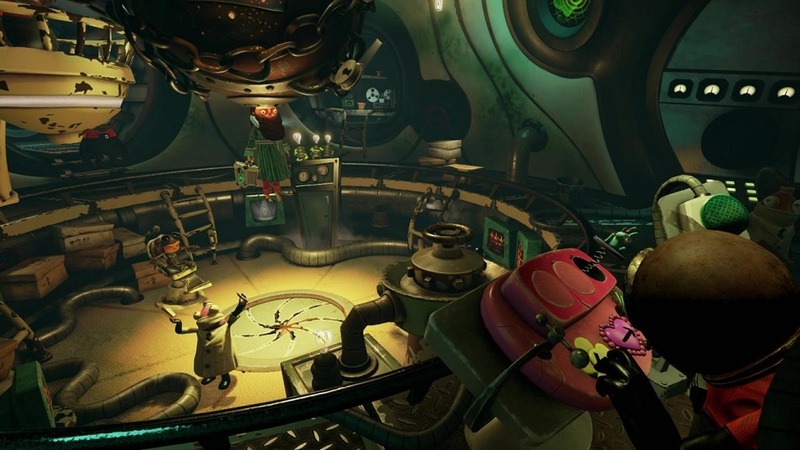 Double Fine’s gift for wit and writing shines through in the dialog and characterization,and the Jhonen Vasquez-esque art style translates well into the technical limitations of VR by emphasizing some of the sight and perception tricks Double Fine plays with. The studio also appears to try a number of visual gags tied to VR’s capacity for immersion and scale, allowing players to look up at gigantic people or down from the perspective of some mighty creature. In a limited way, some sequences from Rhombus of Ruin feel like a full realization of what Double Fine could only partially accomplish with their original (and somewhat mundane) action-platformer. Perhaps what’s most questionable about Psychonauts in the Rhombus of Ruin pertains to the value proposition. At its suggested price the game is quite short, with the campaign lasting just a couple of hours and ending just as it manages to draw players in. There’s also not much replayability, leaving it less “dense” with content than comparable “experiences” like Batman: Arkham VR. This may sour some post-RE7 folks who are looking for more substantial experiences fully playable in VR, but Psychonauts in the Rhombus of Ruin doesn’t do much to advance that prospect. Disclosures: This game was developed and published by Double Fine Productions. It is currently available on PlayStation VR. This copy of the game was obtained via publisher and was reviewed on the PS4. Approximately 2 hours of play were devoted to the single-player mode, and the game was completed. There are no multiplayer modes. Parents: According to the ESRB, this game’s rating is E10+, and contains fantasy violence. The story features the use of psychic powers, conducted from the perspective of the player, including telekinesis, pyrokinesis, and clairvoyance. Some characters are underage and engage in romance. The game is played in VR, which may cause motion sickness in some players. PlayStation VR is not recommended for use by children under the age of 12. Deaf & Hard of Hearing: The game features subtitles in English. One possible issue with the subs is that they don’t always follow the player’s gaze immediately, so some speech cues might be missed if the player is looking the wrong way at the wrong time.